When traveling, I realized that most of Berlin has little traces of the actual wall. The footprint of the wall remains throughout the city represented in a brick line, but other than that, buildings and roads have replaced any signs of the wall. I feel that this is partly because the residents of Berlin want to try to forget about the wall. They know it is part of their history, but they don’t want to show off a part of their past that they are not proud of. None-the-less the wall has made an impact on the urban layout of the city. Places where the wall was are now replaced by streets and sometimes even are covered up by buildings. The changing urban layout of Berlin is most evident in Potsdamer Platz. I found Potsdamer Platz to be very interesting during my travels because the location used to be all dead zone. In its early years, it was a somewhat vibrant part of the city until the wall replaced it. For the lifetime of the Berlin wall nobody set foot in that area. Upon the fall of the wall it has grown dramatically with tall modern buildings. To the untrained eye the wall is unnoticeable because the footprints of buildings overlap and conceal the footprint of the wall. However, a brick line cuts across the streets and through the floor plan of several of the new structures and a small “memorial” stands illustrating the history of that area. I found this to be very interesting because that part of the city has been completely flipped with a few small parts of history that peak through. All this took place in the last 20 years. 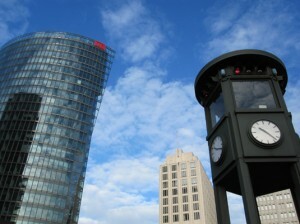 One thing that I do not like about Potsdamer Platz was that it did not seem to be true to the character of Berlin. Most of Berlin is successful at being a walkable city. Mixed-use buildings with commercial on the bottom and residential on the top line almost all the streets of Berlin, but Potsdamer Platz seems to be imitating a more modern American city with skyscrapers. The mall and the train station give the street pedestrian traffic the design is not what I would consider to be sustainable. « Can Los Angeles Ever be a Walkable City or Are People Happy With the Way Things Are? really good article. Ready to hear more next week,my blog http://blogtext.org/talonmpgraham/article/548324.html Many Thanks…. I have spent a bit of time going through your posts, more than I should have but I must say, its worth it! http://wuwu071.i.ph/blogs/wuwu071/ many Thanks…. I have spent a bit of time going through your posts! http://denna.sensualwriter.com/2011/06/20/carla-zampattis-openers/ ,i had a good read…. It’s such a great site! http://heathmlkhan.xanga.com/750972020/brian-vickers-maintaining-choices-open/ Great post, I just bookmarked it on Digg….